Beautiful card Nancy. Love your take on the color challenge and the design of your card. Yes, I agree with you on those purchases we have to have. 🙂 I debated a long time on buying these flowers dies and finally gave in. I have used them a couple of times and need to use them more. Lovely card and great layout! Very pretty flower dies and great design. Love how you worked in the colors of the challenge. When I saw this, I thought this would be great for the February Challenge at STB. Only in felt. 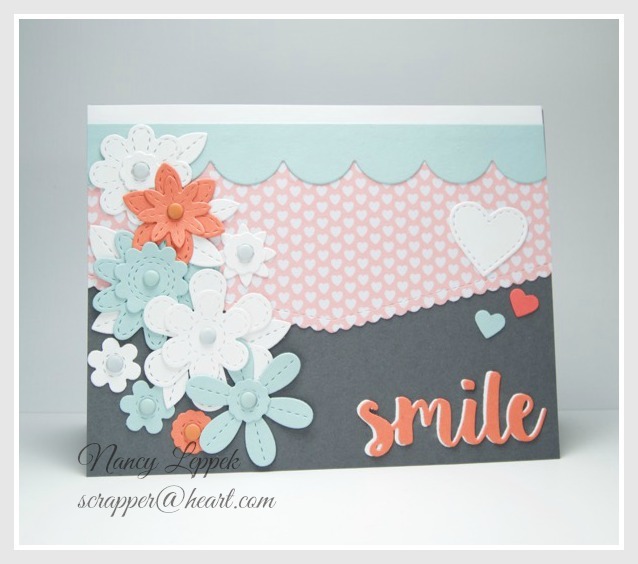 Great use of the challenge colors to make such a beautiful card, Nancy. The arrangement of flowers is wonderful. This is so gorgeous and fun! Love the pretty dies and lovely colors. Beautiful colors! Love your design and those awesome stitched flowers!